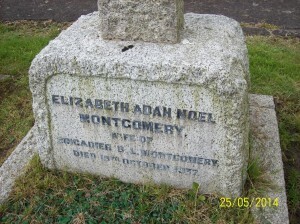 Elizabeth Adah Noel Montgomery was the wife of the (then) Brigadier B.L. Montgomery (Monty), who was known for his contribution to the war effort in World Wars I and II. It seems that Elizabeth was on holiday at Burnham in late 1937 and stayed at the Richmond Hotel, where she was bitten or stung on the foot, possibly by an insect (thought to be a bee). Her foot became severely inflamed and eventually caused her to be taken to the hospital in Love Lane. Unfortunately the affected part did not heal and was amputated and as the initial operation was unsuccessful she died of septicaemia on 18th October 1937, aged 48. Her husband was with her at the time of her death and she died in his arms. 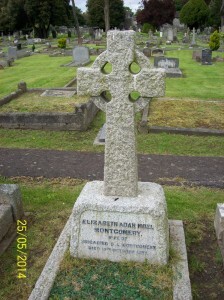 She is buried in Westfield Road cemetery. Elizabeth and Bernard Law Montgomery (1887 – 1976) were married in 1927, Brentford registration district. The death of Elizabeth Montgomery was a blow from which Monty never truly recovered. My mother would tend the grave and we, as a family, had the great privilge of visiting Monty at his home, Islington Mill. We went on several occasions and I have a photograph taken by his son of all of my brothers , with Monty, in front of the caravans he ‘liberated’ from Rommel. I was only seven at the time but I won’t forget him asking questions on geography. We didn’t know the answer which prompted him to say ” you tell your geography teacher Montgomery says he’s no good”! He was essentially an extraordinarly kind man and much misunderstood. God only he knows what he would think of today’s Britain. Many thanks for your thoughts. What was your relationship to Monty? Alan, many apologies after all these years I have only just seen your question. We had no relationship but my mother wrote asking if we could visit.